QA1 K-Members & Braces - White Smoke Motorsports LLC - "The Future of Performance"
QA1’s tubular K-members are designed from the ground up for weight savings, improved geometry and as a bolt-in swap for the factory K-member. All mounting points have been digitally indexed from new, factory K-members. Up to 28 lbs. lighter than the factory K-members with increased strength by design. Header and oil pan clearance maximized for easier maintenance and installation. Spring perches are removeable for extra weight savings when using coil-over kits. Stock or aftermarket a-arms can be used. Bump steer, anti-drive and Ackerman angles have been improved for maximum performance. If the vehicle has been modified, there is a potential for tire to fender clearance issues. This k-member will change the vehicle’s stance to a performance race stance. For best results, QA1 control arms are strongly recommended. 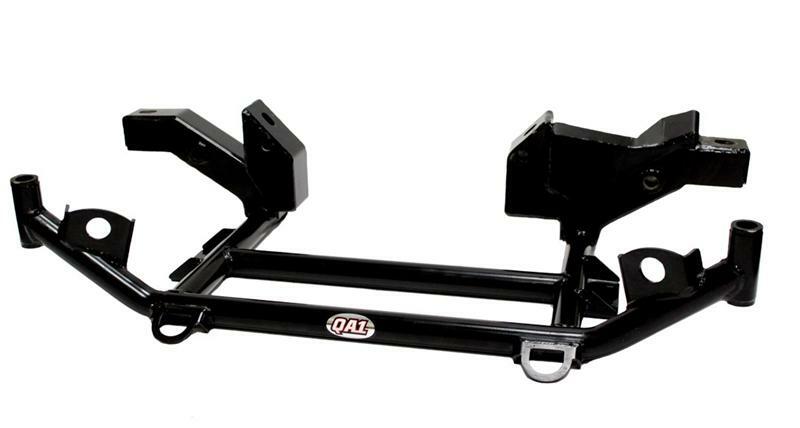 QA1’s Mopar K-Members are direct bolt-ons to 67-72 A-Body, 71-72 B-Body or 70-74 E-Body vehicles. Engineered for maximizing strength, the K-Member comes with motor mount attachment points to accept factory and aftermarket motor mounts. The tubular design also allows for greater header clearance. QA1 K-Member Braces are designed to stabilize the front suspension during hard cornering, allowing for improved control and handling. These braces reinforce the OEM cross member, also known as the K-Member, and help to keep the lower control arms from distorting during extreme conditions. They are currently the only braces on the market to feature an adjustable sleeve for fine tuning the preload.